With the extensive knowledge and experience in this respective domain we are engaged in offering high quality Karl Fisher Titrator. 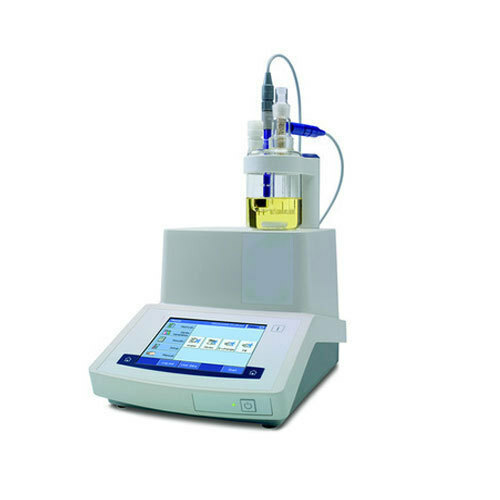 This titrator is ideal for measuring water content level from range of 100 ppm to 100% water. Our offered titrator is precisely designed using basic components and modular techniques under the visionary guidance of trained professionals. We offer this titrator to our clients in different technical specifications as per their choices. The new Mettler Toledo volumetric Karl Fischer compact titrators V20 and V30 have been designed for a wide range of water content applications — determinations from a few 100 ppm to 100% water, quickly and precisely. The compact coulometric titrators C20 and C30 are ideal for water contents in the range 1 ppm to 5%. The V30 and C30 titrators can be equipped with the Stromboli oven sample changer for a fully automated system. We, The Bharat Instruments & Chemicals, started operating in the calendar year 1972, as a trusted Manufacturing and Exporting the wide range of Industrial Micropipettes, Analytical Balances, Laboratory Equipment, etc. Further, our supplied autoclave and sterilizer is efficient in the sterilization of the surgical and dental tools. Additionally, our offered analytical balances are designed to measure the sub-milligram mass of laboratory products. Further, our manufactured measuring equipment is widely used in the science and research laboratories, across the world. Our offered deep freezers are widely used for the refrigeration and preservation of food products such as ice cream and raw meat. The supplied deep freezers are electrically operated machines, which are capable of thermally insulating the food material. Additionally, our modern infrastructure unit consists of separate sub-divisions for production, quality assurance, warehousing, logistics, and administration. Further, our clientele includes the research firms and clinical units across the globe.